Thank you for stopping by to request a spiritual/psychic reading. 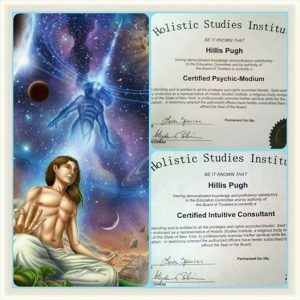 I am a certified psychic medium and intuitive consultant from the Holistic Studies Institute, offering spiritual readings to heal the soul. My purpose is to use the innate psychic and intuitive abilities to hear loved ones and guides to raise each client’s personal vibration. I am a Clairaudient Psychic Medium. First and foremost this reading is about you. To complete the reading I do require a set of questions and pictures. All readings can be done in person or over the phone. As a client, you can expect the utmost confidentiality. In the one-hour or 30-minute session, I connect with your loved ones and/or spirit guides to bring forth messages to answer the desired questions, allowing for healing and clarity in your life. Thank you for your time, energy, and respect for the work I do. I was very interested in learning more on how to embody gratitude in my life and to gain more insight into my own healing. I also had the privilege of working with Hillis for a private psychic reading. Hillis provided a safe space to have a healing experience and provided so much insight into my connection with those who have passed and what their messages for me. The private psychic reading with Hillis was very affirming and powerful. I like how I was given questions to answer beforehand which really helped to focus and guide our session together. A lot came out in my time and his intuition is spot on. It was a pleasure to work with Hillis and I highly recommend him.